The Johns Hopkins Scleroderma Center focuses on clinical and translational research in the context of comprehensive patient care. Our patients’ generosity and willingness to share their clinical data, biological samples, and time is the key to the success of our clinical research operation. We are interested in studying all facets of the scleroderma disease process in order to learn about the biology of the disease, to identify the most accurate biomarkers to measure disease activity and predict prognosis, and to discover new treatments to improve our patients’ quality of life. Some of our current research projects are outlined below. Biomarkers of Vascular Disease: A Prospective Cohort Study. PI is Dr. Hummers (Collaborators: J van Eyk, FM Wigley, Z McMahan, A Shah): The goal of this prospective cohort is to evaluate novel biomarkers that will predict which patients with scleroderma may develop future severe vascular disease (such as digital ulcers or pulmonary hypertension). This study enrolled 300 patients who have been followed for an average of 5 years now. We are now in the process of measuring optimizing a panel of biomarkers for analysis to evaluate the ability to predict adverse outcomes in scleroderma vascular disease such as pulmonary hypertension. An analysis of clinical predictors is currently underway now. Measuring Vascular Burden in Scleroderma Associated Raynaud’s Phenomenon. PI is Dr. Shah (Collaborators: J Carrino, S Zimmerman, FM Wigley, LK Hummers; Study supported by MedImmune LLC): This study seeks to determine the reliability of two test measures (magnetic resonance angiography and laser Doppler imaging) in patients with scleroderma-associated Raynaud’s phenomenon. In addition, we are correlating measures of anatomy and perfusion with patient centered measurement tools, examining whether vasospasm can be differentiated from structural vascular abnormalities on MRI, and evaluating the utility of a non-contrast MR method for imaging hand arteries. Measuring burden of pulmonary vascular disease. PI is Dr. Hummers (A Shah, FM Wigley, R Wise, C Ligon, C Lin): We currently have very few good ways to measure the progression of vascular disease in the small blood vessels of the lung. We know there is vascular pathology that leads to pulmonary arterial hypertension in some patients, but to directly measure it requires invasive testing. This study seeks to investigate some novel but readily accessible data from CT scans of the chest to try and quantitate the vascular disease in the lungs in patients with scleroderma. Natural history of lung disease in scleroderma. PI is Dr. Suchi Saria (Collaborator: S Zeger, LK Hummers, FM Wigley, R Wise, P Schulam, C Ligon) We are utilizing the rich data from the Johns Hopkins Scleroderma Center database comprising a patient’s symptoms, test values, interventions and outcomes over the length of the disease course to develop novel computational methods to use such observational data to estimate and predict an individual’s disease trajectory. We will also develop methods to help identify whether an individual is likely to respond to a therapy and the likely affect of the therapy on their disease course. Our solution will be developed into a point-of-care application that will be used by clinicians at The Johns Hopkins Hospital. The Biology of Transforming Growth Factor Beta. Dr. Hal Dietz is now continuing his studies, and we are providing tissue samples from our patients for him to study. He has demonstrated that tissue from patients with “Stiff Skin Syndrome” have similar pathological findings as patients with scleroderma explaining how tissue fibrosis may occur in these two fibrosing diseases. In addition, using scleroderma fibroblasts grown from skin biopsies, he has evidence that regulation of collagen genes is abnormal in scleroderma. Cancer in Systemic Sclerosis: Investigating the Connection. PI is Dr. Shah (Collaborators: FM Wigley, LK Hummers, A Rosen, L Casciola-Rosen, B Vogelstein, K Visvanathan, T Igusa, J Ellis; Sites: Johns Hopkins Scleroderma Center, Division of Oncology, Systems Institute, Rheumatic Diseases Research Core Center; Current support is through NIH K23 award and Jerome L. Greene Foundation): This multidisciplinary translational investigation seeks to probe the link between cancer and systemic sclerosis. Dr. Shah, et al. discovered that patients with the onset of cancer and scleroderma at nearly the same time have a high association with antibodies to RNA polymerase III. The antibodies are specific for scleroderma and in our patients also target the cancer tissue. This work has yielded 3 original research articles in Science and Arthritis and Rheumatology, as well reviews on paraneoplastic scleroderma. Numerous other important epidemiologic and basic science investigations are underway to understand how cancer and autoimmunity are linked. Genome Research in African American Scleroderma Patients (GRASP Study). Dr. Wigley is the PI at Johns Hopkins (Collaborators: D Kastner and P Gourh at NIH/NHGRI and F Boin at UCSF): This is a multicenter study established in partnership with the National Human Genome Institute (NIH/NHGRI) with the major goal of discovering new disease-associated (susceptibility) or phenotype-associated genes in a large (nation-wide) population of African American patients affected by scleroderma. We are coordinating approximately 14 academic centers nationwide. The first phase of the study is active with ongoing shipments to NHGRI of DNA already collected within the GRASP centers. A “flagship” proposal has been submitted to the NIH Intramural Sequencing Center (NISC) to pursue immediately whole exome-sequencing on 100-400 SSc samples and 100-400 controls. This will allow the identification of SSc specific exonic variants that can be then further studied during Phase II) on a larger population (~1000 patients) using customized Human Exome Bead Chips. Mechanism of muscle disease in scleroderma. 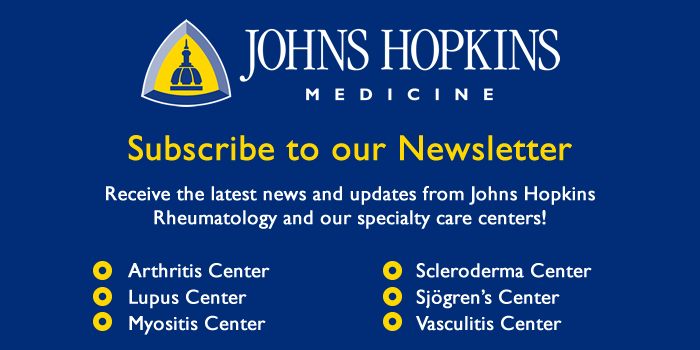 PI is Dr. Paik (Collaborators: A Mammen (NIH), FM Wigley, LK Hummers, A Shah): We will utilize resources of the Johns Hopkins Myositis Center and collaborate with Dr. Mammen’s basic laboratory to understand the pathogenesis of muscle disease in scleroderma. Our preliminary data demonstrated there was markedly increased phosphorylated SMAD2/3 in scleroderma muscle biopsies when compared to other inflammatory myopathies such as dermatomyositis and inclusion body myositis. The future plan is to confirm these findings and determine the specificity of TGF-beta activation in scleroderma muscle disease. Scleromyxedema study. PI is Dr. Hummers (Collaborators: F Boin, A Fava, G Hinds, C Cheadle, . FM Wigley): Scleromyxedema is a very rare disease that causes a mucinous deposition in skin and internal organs. We have evaluated over 25 patients with this disease in our center and have noted a consistent improvement with IVIG treatment. Therefore, we are trying to exploit this treatment benefit to try and understand some of the underlying immunological abnormalities by studying the blood and skin before and after this treatment. Initial analysis of skin biopsies and peripheral blood flow cytometry is underway.